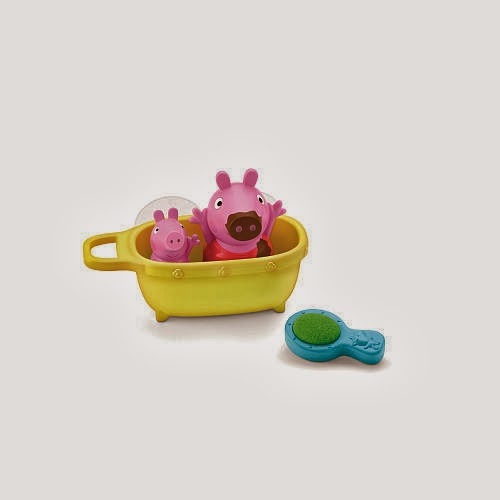 Top Notch Material: We love Peppa Pig Toys! 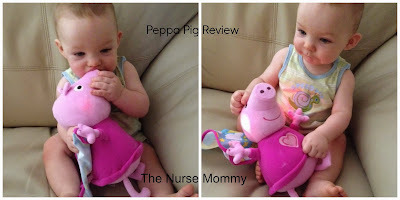 We love Peppa Pig Toys! It is pretty common knowledge around here that we love Peppa Pig. Actually, I am not sure who loves Peppa more, me or my little guys! I love the accents and I love the bond that Peppa shares with Daddy Pig. Over the past few years we have been lucky enough to review many Peppa Pig products and we love them all. The books are always colorful and interesting, and I love reading them in a British accent to my little guys! We received Peppa Pig and the Busy Day at school. 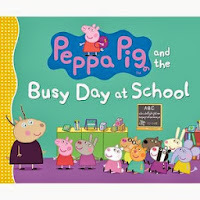 My oldest really enjoyed this because he often has a busy day at school in his first grade class, so he completely related to Peppa and her friends. The book is intended for preschoolers, and helps prepare them for the idea of school. It even has a page with letters and words that are associated with that letter. Preschool or not, my oldest loved it, and the baby enjoyed sitting with us too. He kept pointing at different characters as we read. My little man is a huge fan of Bedtime Peppa. She sings "Brand New Day" and her cheeks light up. She is soft, and very lovable and little man had to sneak in a few kisses. The perfect Christmas gift for a Peppa loving toddler in your life! Muddy Puddle Bathtime Peppa: This was really fun for both my boys. Granted, little man just tried to eat them. My older son loved using George as a squirt toy and we loved that the bathtub suction to our bigger bath. The mud on Peppa disappears in warm water, when she gets "clean." It is a very cool toy that we are happy to add to our bath toy collection!